"I believe that all experiences, even grief, can take shape and create sometime new and beautiful." When food illustrator and stylist Anna Keville Joyce lost her pet bird, she took a moment of grief and turned it into something beautiful with her plate illustration series titled A Tribute to Budgie. 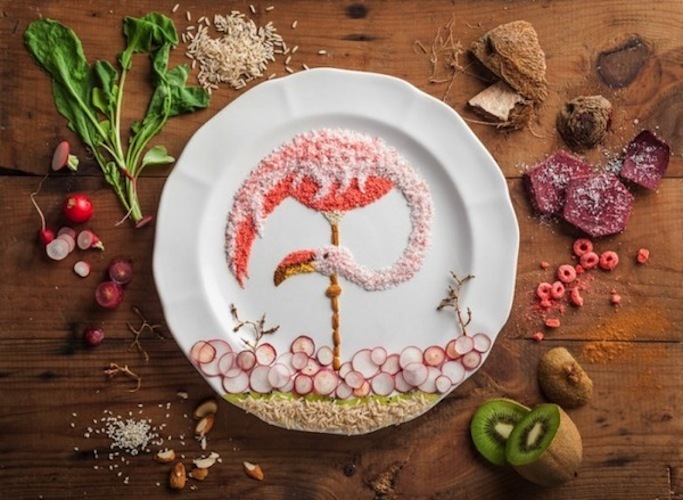 The illustrations, which were photographed by Agustín Nieto, feature elegant birds created entirely out of food arranged on and around a plate—crushed up Fruit Loops are incorporated into the body of a flamingo, while a mushroom becomes the eye of an owl. Where did the title, A Tribute to Budgie, come from? The title of the project comes from a bird I had named Budgie. Really, it’s related to a loss of a relationship in which I also lost my bird. It’s more of a metaphor, and a dedication to both. It’s my tangible expression of mourning, a mediation and part of my healing process. I believe that all experiences, even grief, can take shape and create sometime new and beautiful. Since it’s food, I have to create the pieces within a few hours. I start with the longest lasting ingredient (hopefully!) and work my way backward to the most delicate. 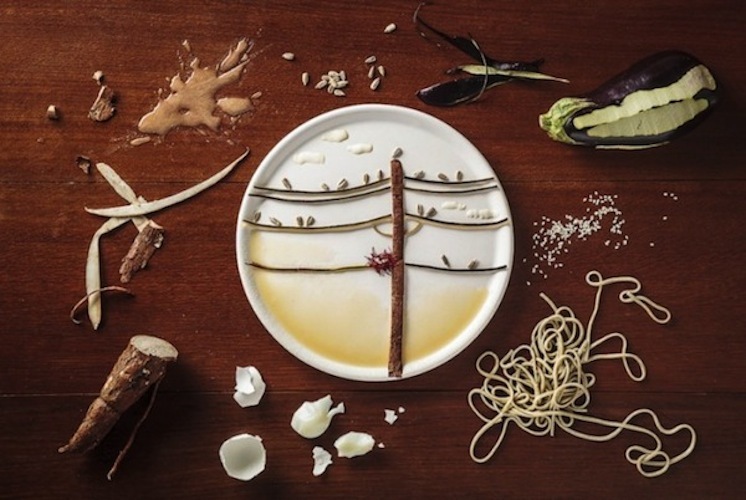 What got you interested in playing with food to create art? I’m a food stylist by profession, which is to say that I create food for commercial photography and film. Food is what I understand best—I know how it moves, how it responds, how to care for it, how to make it last, its color hues, and when it’s going to shrivel and die on me. It’s my favorite medium. 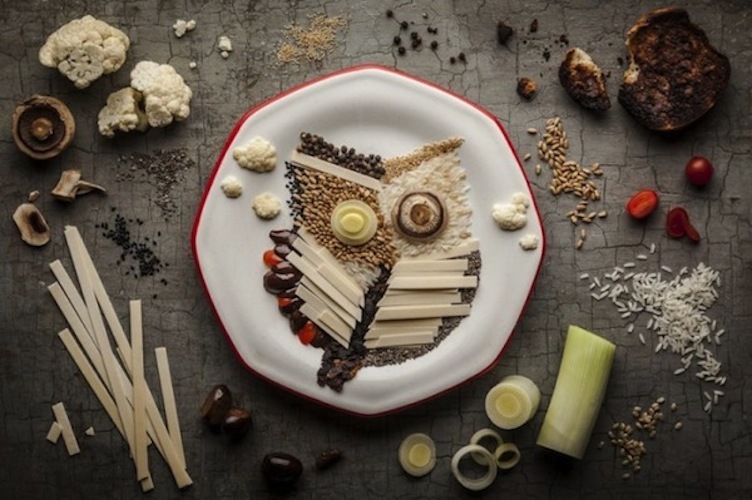 My styling work, although commercial, really comes down to simple food sculptures; shape and color through food. 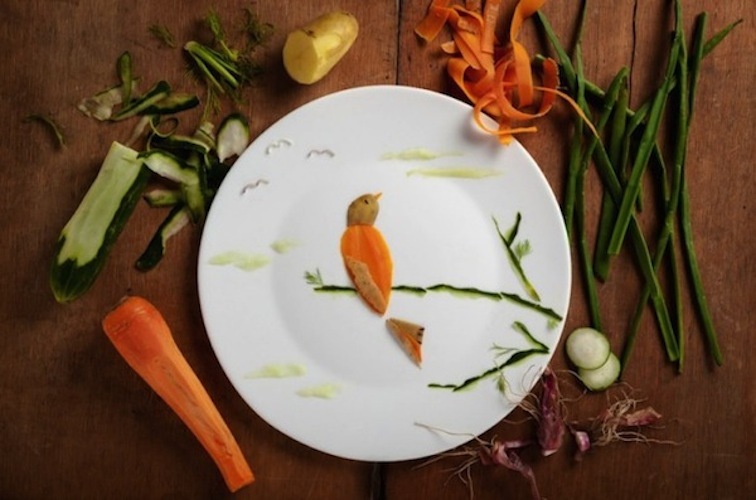 Food illustration is just another expression of the same. Food is dynamic, which is what I like most. There’s only short moment when everything comes together. A moment before or a moment after just isn’t quite right. It’s not drawing, where you can erase, and it’s not oil paint, which patiently waits for you to come back and retouch. It’s the five minutes you have with raw, transparent cucumber flesh before it dries out or turns brown to see if you can get it to express streaky, wispy clouds. How long does it take you to complete each work of art? I bring the concepts together little by little. I gather references and I collect interesting details, like horizontal mushrooms growing on tree trunks. Then, I make a draft drawing incorporating my favorite aspects and concepts. I do all of the ingredient purchasing based on what I think will work, and then whatever food element just seems interesting. I buy a lot more than I what I end up using, but it’s like needing a diverse color palette for painting. You don’t use every color, but you need the options. Then, since it’s food, I have to create the pieces within a few hours. I start with the longest lasting ingredient (hopefully!) and work my way backward to the most delicate. Sunflower seeds are very expressive, as are eggs whites and eggs yolks, surprisingly. I like to work with the fleshy parts of different fruits and vegetables, making them less distinguishable but giving different textures and colors that are unexpected. 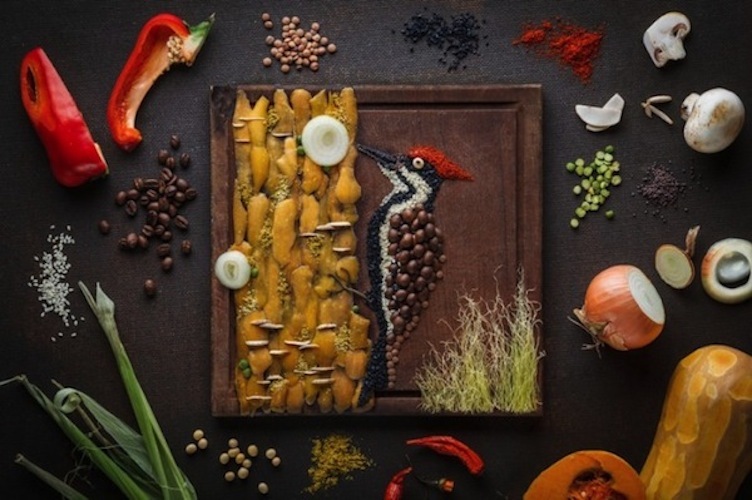 Any future food-related art projects?